According to recent surveys conducted on behalf of Baldwin County’s coastal residents and the Alabama Department of Transportation (ALDOT), the remedying of traffic woes in Gulf Shores and Orange Beach should be a top priority for state and local officials. On ALDOT’s list of the state’s 20 busiest two-lane roads, Canal Road — with a daily average of 15,510 vehicles — ranks 18th. Coincidentally, in an unrelated, informal survey, Orange Beach residents listed traffic improvements as their second priority in a list of 10. 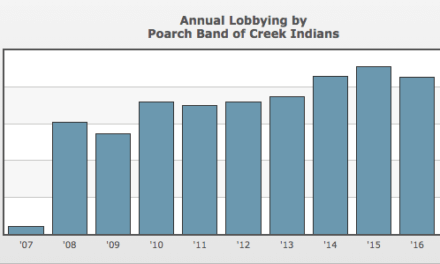 A new bridge — either over the Intracoastal Waterway or Wolf Bay — was the second priority in a separate list. The city is already planning to widen Canal Road and improve its congested intersection with State Highway 161. 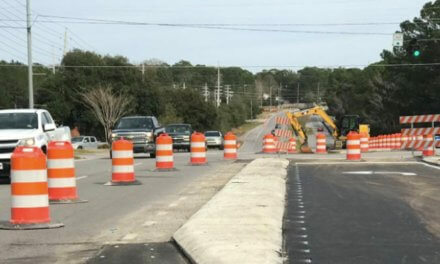 A separate project will expand William Silvers Parkway near the Orange Beach Sportsplex. But at a town hall meeting Oct. 20, the city unveiled the proposed route of a new bridge to span the Intracoastal Canal, providing a new route between the Foley Beach Express and State Route 182 along the coast. (Photo/City Orange Beach) The proposed route of a new bridge (yellow) and existing one (orange). The proposal includes plans to carve a new road through Gulf State Park, where the state is also planning to spend more than $85 million in BP oil spill fines to build a resort hotel and convention center. Vince Calametti, ALDOT Southwest Region engineer, said the bridge is necessary to meet the county’s needs for additional north-south traffic. According to Calametti, State Route 59 is at capacity and some drivers are still hesitant to use the Foley Beach Express toll bridge because they don’t want to pay the $3.50 fee. The bridge is still in the design phase and will be the second of three phases of construction on the route, from north to south. 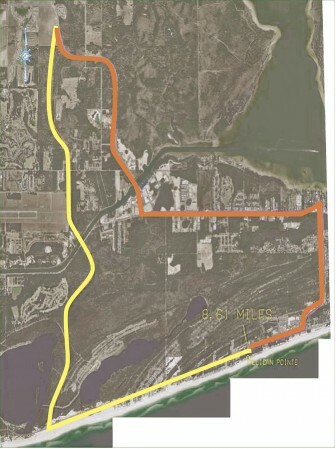 The first two phases will create a new road from the intersection of the Foley Beach Express and Baldwin County Road 8 to Baldwin County Road 4, through developed private properties and forested land, past the eastern border of Jack Edwards Airport, on the way to the proposed bridge and its connection to Canal Road. The third phase would connect Canal Road to the beach by cutting through the state park. ALDOT Director John Cooper said the first two phases have an estimated cost of as much as $28 million. Additional property owners who could be impacted by the project, for better or worse, include Edwin G. Cowdin, Orlanda B. Clark-Perrault, Richard E. Nolte Jr. and Olivia Reagan Coates. Further south, the road would travel along the existing Waterplant Road — adjacent to property registered to the family of former Gov. George C. Wallace — through undeveloped canal-front parcels owned by Charlotte, North Carolina-based Coastal Resort Properties. The route crosses the canal, where the bridge’s southern end — depending on its design — may cross over Canal Road before connecting on land owned by Laura Rogers Almaroad. Meanwhile, Joe Emerson, a 20-year Gulf Shores resident, is leading a social media charge against the proposal, which is just one and a half miles west of the existing Foley Beach Express toll bridge. Emerson suggested any hopes a new bridge would alleviate traffic on Canal Road without an additional connection to the beach are unfounded. Emerson started a Facebook group called “End the #Bridge2Nowhere” which included 380 members as of Nov. 9. He was also photographed in The Islander newspaper protesting at the site of the bridge with a homemade sign declaring the project a “bridge to nowhere” and “poor planning.” He said it’s been a conversation starter. Calametti said the state would reimburse property owners for right of way acquisitions. He said he could not judge the public’s reaction to the proposed bridge, but said residents at the town hall meeting seemed receptive to another announced project to add an additional lane to Canal Road. “I didn’t get a feel for the reaction to the bridge in any way,” he said. The first section of the project could be under contract next year, but Calametti said work on the bridge over the Intracoastal Waterway won’t begin until the end of 2016 or into 2017. Still, the state has no concrete plans to connect the new road to State Park Road 2, which circumnavigates Lake Shelby in the park.